On February 12th, Xiaomi officially announced that this year's new red rice Redmi Note7, since its launch on January 15, has shipped more than 1 million units in mainland China. It is worth noting that Redmi's positioning is mainly in the e-commerce market, only online channel sales, considering that the Spring Festival holiday is the off-season of traditional e-commerce sales, in this context, the red rice Redmi Note 7 shipments broke 100 It took less than a month for 10,000. The Xiaomi Group announced that the first mobile phone launched by the Redmi brand has achieved such good results, reflecting the initial success of the company's multi-brand strategy and further demonstrating the company's strong product development, supply chain management and retail capabilities. This achievement also proves that the value positioning will be more competitive in the current market conditions. 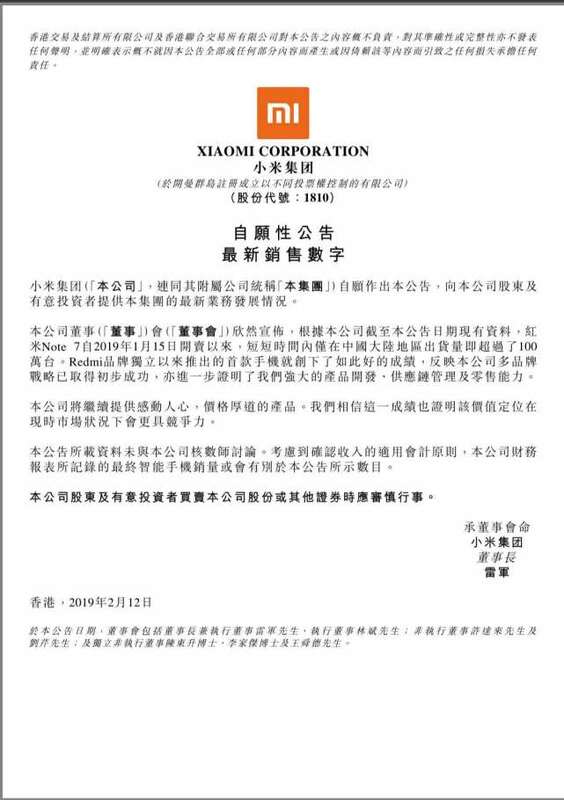 In the first year of 2019, Xiaomi continued to move. First, the red rice brand was independently established. Lu Weibing, former president of Gionee Group, was appointed as the vice president of Xiaomi Group and the general manager of Redmi brand, and also released the red rice Redmi Note 7 with the internal codename Xiaojingang. Then, officially launched the “Mobile +AIoT” strategy and used this as the core strategy for the next five years. Among them, the mobile phone strategy continues to innovate, quality and delivery, and implements a multi-brand strategy for mobile phones. The two main brands, Xiaomi and Redmi, are independent of each other. Xiaomi is based on the high-end to the flagship market and the new retail line is under the omnichannel; Redmi will die for the price and e-commerce market. Black Shark, Mito, and POCO brands will be used on the vertical tracks of games, women, and overseas geek users. Samsung Note7 BNM Edition Experience: buy buy buy or wait iPhone7?